Fast forward a few years (ok, more than a few), a slightly more mature cultural awareness, and a couple of kids. As I was planning some upcoming weekend trips to Chicago, I asked for kid-friendly ideas from my traveling friends. Jessica from Suitcases and Sippy Cups said her family had fun at the Art Institute of Chicago (and she's got her own great tips for a visit, including these flash cards), so I decided to give it another go. During one of our trips to Chicago this year, my husband and I were traveling only with Little Arrow (at the time, 4 months), so I thought this was the perfect time to explore the Art Institute. Without Big Arrow, we didn't get the full "visit with kids" experience, but we spent a lot of time checking out the Ryan Education Center. I have to say, never have I missed Big Arrow more than while we were here. He would have loved everything, from curling up with a fun, art-inspired book in the Vitale Family Room, to touching art in the Elizabeth Morse Touch Gallery, to getting crafty in the art studio. 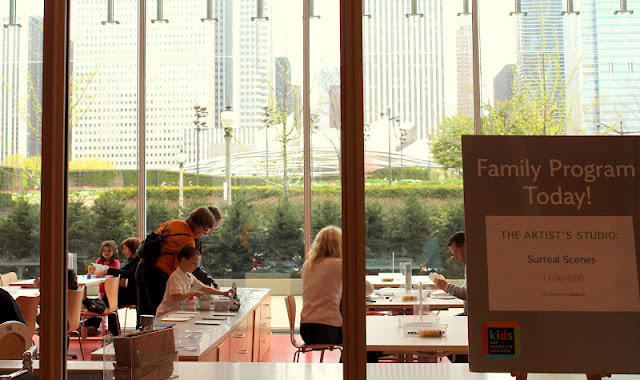 Read the Art Institute of Chicago's family visit planning guide. It's full of really useful info and will help you better determine what you should do during your visit depending on the ages and interests of your kids. There are family-friendly tours, tips for checking out the galleries, and advice for looking at art with your kids. Invest in a Chicago CityPass. * The Ryan Education Center is free (that's a STEAL, people!) but if you want to explore any of the galleries (and you should), you'll need to purchase admission for anyone in your family 14 and older. A Chicago CityPass greatly reduces your admittance cost (and gets you into a lot of other great Chicago attractions at reduced cost, like the Museum of Science and Industry and the Museum Campus attractions). Tag team with your traveling partner. If you bring your spouse, friend or a grandparent along on your travels, you could spend even more time in the galleries by trading off with another adult (one stays with the kids in the family area, while the other enjoys the rest of the museum, then you switch). Introduce some of the famous pieces to your kids in advance of your trip. I laughed out loud (sorry, fellow art patrons!) 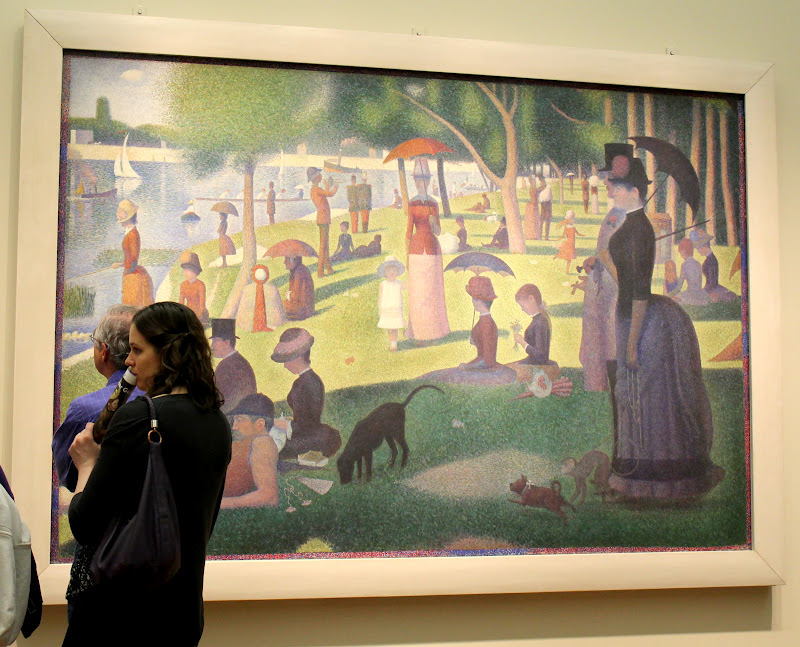 when I saw Seurat's Sunday Afternoon on the Island of the Grande Jatte at the Art Institute. I can't tell you how many times Big Arrow and I have read Baby Einstein's Master Pieces,* and that's the painting on the final page of this book. He would have been so excited to see it in person. There are a lot of other extremely famous and well known paintings (like American Gothic and Nighthawks) that you could show your kids and discuss. There's also this suggested list of children's books. Wear the kids out before or after by visiting Millennium Park. Just north of the Art Institute is this iconic Chicago park. And the best part for parents is that there is ample room for kids to run around (especially as you get further away from some of the popular attractions there, like the Cloud Gate sculpture). Just south of the Art Institute is Grant Park, another great Chicago landmark. This kind of green space is rare in a city so large, so use it to your advantage! 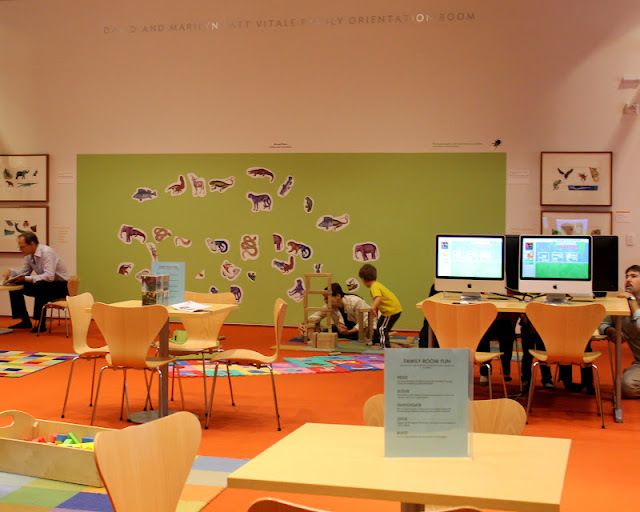 Time your visit to experience some hands-on learning in the art studio. A calendar is available here. The kids we saw were having so much fun that I wanted to join in, but thought it might seem a bit awkward since Little Arrow is a little young for finger paint. In my opinion, the Art Institute of Chicago is a model for making visits to a more adult-oriented museum not just family friendly, but family fun. I'm glad I've grown a little wiser since my high school days. Open 10:30-5 daily except Thursdays when it closes at 8 p.m.
Great Tips! I am glad you enjoyed the museum! Nicole! I can't believe you skipped out on your school field trip. My whole image of you is...well...reinforced really. I always knew you were a rebel underneath that wholesome mommy image you project. The institute looks fun. I really like the Artist Studio overlooking Millennium Park. What a great place to do some painting, even if it is with your fingers. Great tips - Emma and I will be visiting Chicago for a few days this summer and I can't wait to return to the Art Institute. Seurat's Sunday Afternoon is one of my favourite paintings! I LOVE the Art Institute. Even applied to their grad school ;-) We are hoping to take a trip back to Chicago at the end of the summer so we can catch up with some friends. This will certainly be on our list. Thanks for linking up and sharing your tips so we can all benefit on our next visit to Chicago! We have a budding artist in our family and this looks like the kind of museum she would fall in love with. Another place to add to our list... Thanks for sharing your experience!